Hey Nosh Show Listeners! I'm afraid I'm not on Episode 108 of the Nosh Show because I was busy "relaxing" (aka not relaxing) in Virginia. While the guys were recording the show without me, I did get a chance to try the shakes at Hardees (aka Carl Jrs). 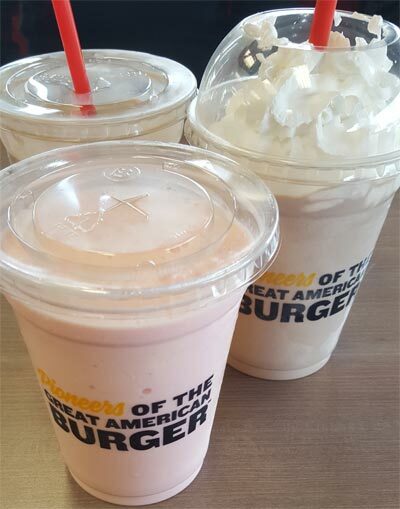 I was impressed with how much I enjoyed the strawberry shake, it hit the spot with my so-so "charbroiled" chicken sandwich (aka a piece of chicken that was sort of warm and seemed to have taken a bath in some red dye). I preferred the fun strawberry flavor over the syrup heavy chocolate shake my wife was drinking. However, she had the opposite opinion. My daughter tried both the vanilla (on our first visit) and the chocolate (on our second visit) and she preferred the vanilla. That said, our only true complaint was that they weren't larger. Ok, technically my daughter did mention that she would prefer a thinner shake with her meal but that's just personal preference there as I definitely prefer a shake that feels more traditional (aka just milk and ice cream). So, have you had Hardee's (Carl Jr's) shakes before? What do you think of them? Do you get them often? Do you get them with whipped cream? I think I would prefer their shake over the other fast food chains and I was a little sad that I didn't get to sneak in one more before our journey ended. Alright, that's it for now, have a good week everybody. There will be a few upcoming posts about some stuff I found in Virginia later on this week.